Recently, I heard from Mary Taylor Simeti, who wrote to ask me if I was going to a tasting of Sicilian wines being held in NYC. Mary writes about Sicilian food, culture and history. Her books include On Persephone’s Island: A Sicilian Journal and Pomp and Sustenance: Twenty Five Centuries of Sicilian Food. Mary wanted to make sure that I was going to the tasting because she and her husband have a small winery, Bosco Falconeria Azienda Biological Simeti Taylor. The winery is located in the hills overlooking the Gulf of Castellamare about 40 miles west of Palermo and has been in the Simeti family since 1933. In 1989 with Bosco Falconerian as its trademark, the farm obtained official organic certification, one of the first in Sicily to do so. The winery produces three wines and the total production is less than 10,000 bottles. Mary hoped that I would like the wines. Not only did I like all three of them, but they were some of the best and most interesting wines at the tasting. Falco Perregrino 2010 IGT Sicily, this wine is 100% Cataratto, organically produced, (certified by Codex). 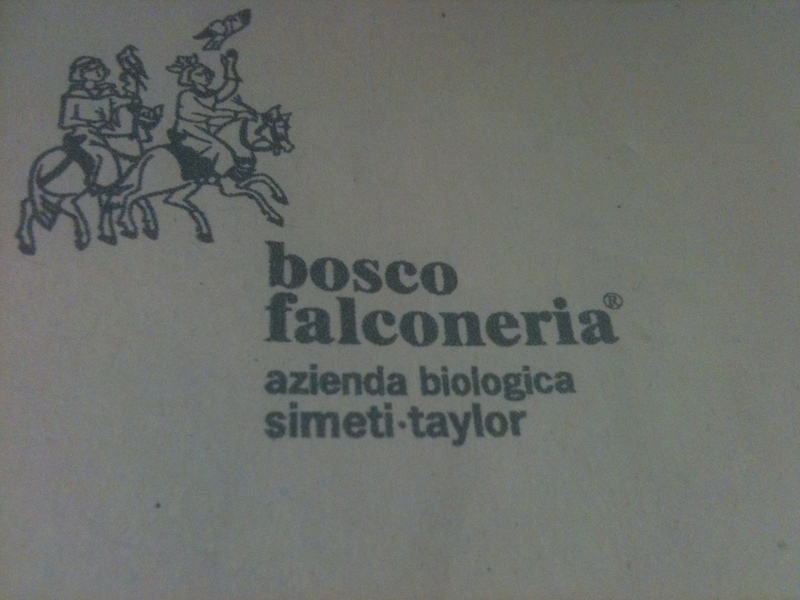 The production area is the Contrada Bosco Falconeria and the altitude is 800 ft. The soil is calcareous and of medium texture. In the vineyard the system of training the vines is vertical trellises and alberello (bush) and there is no irrigation. There are 2,700 vines per hectare, which have an average age of 12 years. The vineyards are treated 2 to 4 times a year with copper-sulphate products and the fertilization is green manure with leguminous and spontaneous vegetation. The harvest is manual and takes place the first half of September. Mechanical destemming and crushing is done with a destemmer with rollers. Via email, Mary explained how it works “… it is an aged do it yourself homebrew destemmer with rollers, but it works on the same principle as the fancy industrial one. The grapes go into the funnel on top (my vocabulary is not technical!) at the bottom of which are two ridged rollers that tear the grapes off the stems and give them a light crushing. The grapes and stems drop into a perforated cylinder – in this case horizontal but can be vertical – and the grapes fall through the holes while the rotating paddles, which work like a screw, push the stems out the side. Sort pressing takes place with a pneumatic press. Fermentation takes place in temperature–controlled stainless steel tanks for 25 days. The wine is stabilized by refrigeration, filtration is with a plate filter and the clarification is done with bentonite. They use select yeasts certified saccharomyces cervisiae (olivar ogar). There is no sulphur dioxide added. I asked Mary about how long this wine would last without the addition of sulphur dioxide and her answer was “Our first Falco was 2009 and it lasted beautifully, actually it was better a year after bottling and we are treasuring the last 20 odd bottles which we are still drinking with pleasure. The 2010 was bottled in February and we have had no problems with that either.” Production is 1,000 bottles all with corks. She also said that they just started the Falco 2011 macerating on the skins with only spontaneous yeasts. 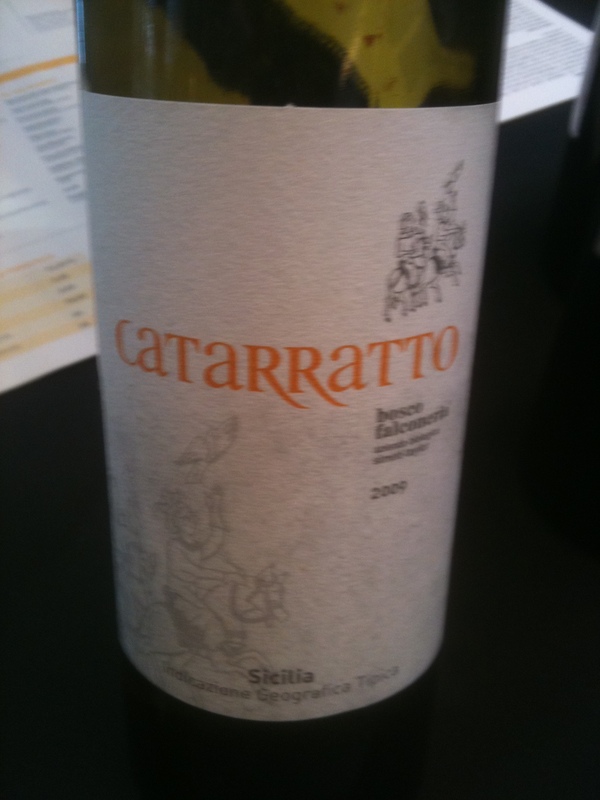 Catarratto 2009 IGH Sicily 100% Cataratto organically produced, extra-lucido (certified by Codex). It is the same as the wine above except the average age of the vines is 8 years and there are 30mg/hl of sulphur dioxide added at pressing and 5mh/hl at bottling. There are 5,500 bottles produced. 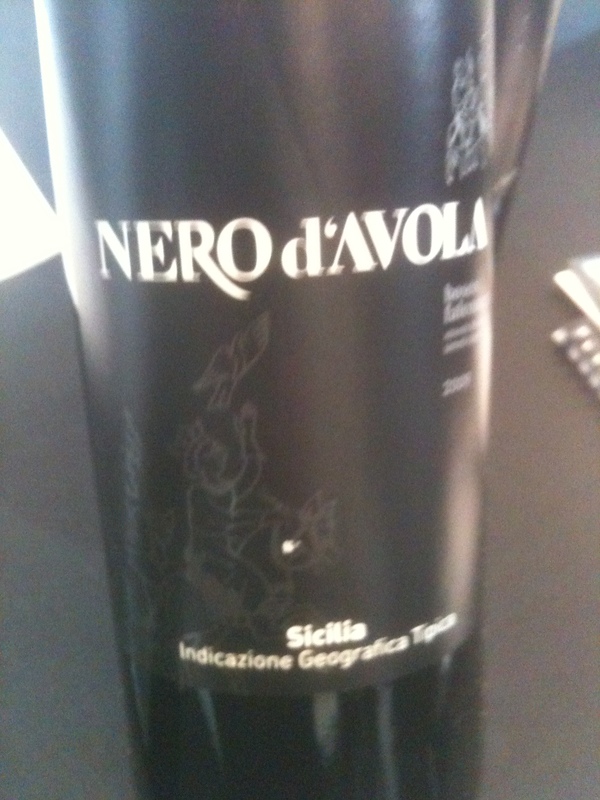 Nero d’Avola 100% Nero d’Avola organically produced (certified by Codex) Same as above except the average age of the vines is 10 years. Fermentation takes place on the skins for 10 to 12 days. The wine is refined in stainless steel for about 5 months. 50mg/hl of sulphur dioxide is added at pressing. 2,000 bottles are produced. Unfortunately the wines are not imported into the US at this time, but they are looking for an importer and I hope they will be soon.